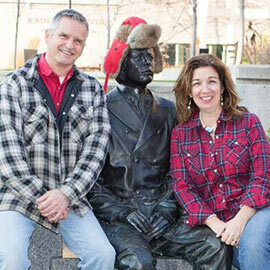 WATERLOO – Instructors Leslie Fagan and Lorin Shalanko from Wilfrid Laurier University’s Faculty of Music will launch their Canadian Art Song CD, Thread of Winter, at an event on April 5 as part of the Faculty of Music’s 40th anniversary celebrations. The event is free, and takes place at 7 p.m. in the Maureen Forrester Recital Hall located on Laurier’s Waterloo campus. The Canadian Art Song repertoire was chosen for its accessibility to young singers. Shalanko feels the music on the CD is beautiful, accessible and appropriate for students. With the release of the CD, the team is hopeful the Canadian Song book can be used as a reference tool for teachers and students. Laurier’s Faculty of Music is celebrating its 40th anniversary and its growth from 69 students in one program to over 400 students across seven degree and diploma programs at the undergraduate and graduate levels.